Though born in Jezerane Croatia in 1967, Davor Sertic moved to Austria with his parents at the age of two months where he has lived ever since. Following his education in the Volksschule Eslarngasse and Gymnasium Hagenuellergasse he went on to attend both technical and business administration schools. He accomplished his MBA at the sales academie in Vienna. 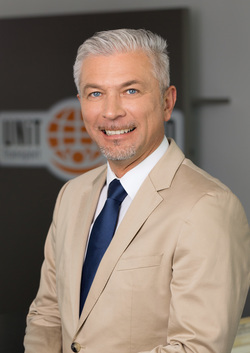 After gaining experience in transport management he began his own business in 2004 with the foundation of UnitCargo specialising in transport of South East Europe, a company which rapidly expanded, opening offices in Slovakia in 2006, Istanbul in 2007 and Bulgaria in 2011. A Romanian subsidiary was opened in 2014. Whilst actively managing the business he gained his MBA in Sales Management in 2007 and is today the chairman of the examination board for final exams in freight and logistics management. In 2012 he, together with Roman Anlanger, Xing Ambassador and bestselling author created the Forum Logistics Intelligence, a focus group and information hub for all logistics professionals within Austria, of which he is the chairman. In 2015 he was elected as President of the Transport and Traffic Division of the Vienna Chamber of Commerce, an important role in the administration of the city since it both represents the interests of all the transport providers as well as contributing to strategic planning policy on transport infrastructure and logistics issues within the area. Vienna must not miss the connection to the future. We need a sustainable logistics concept, so that we can maintain our competitiveness. Vienna's locational advantages, at the centre of Europe, should be exploited to the full extent so that the city, can position itself as the top-freight hub.